Amazon.com description: Product Description: Programming in Dylan is aimed at programmers who are already familiar with languages such as Pascal or C but who, as yet, have no knowledge of object-oriented languages. The author takes the reader through the development of Dylan by Apple and introduces the concept of object oriented languages, comparing Dylan to other languages such as CLOS, Smalltalk and C++. The author looks at fundamental concepts of the Dylan language before moving on to present the basic types (Boolean, vectors, strings etc.). Variables, expressions and assignment, and functions (both named and anonymous) are covered in detail. The Dylan class is introduced in its simple form and generic functions and library classes are discussed in depth. The author shows how modularisation needs to be used if large applications are to be developed and illustrates how to construct program libraries. A simulation and modelling example runs through the book. 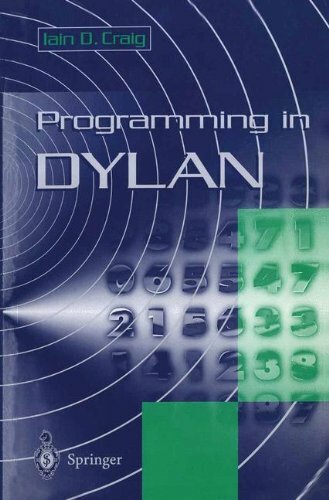 About: Programming in Dylan is aimed at programmers who are already familiar with languages such as Pascal or C but who, as yet, have no knowledge of object-oriented languages.